God, I feel so bad for Jurickson Profar. Once the consensus top overall prospect in baseball, Profar has spent the last few years sustaining and sort-of-recovering-from a series of increasingly strange injuries. That bad luck has reduced him from a franchise cornerstone to a guy who, at 25, mostly seems like someone who might play 80 games every few seasons. A series of injuries in the middle of the Texas infield recently broke loose some playing time for Profar, with shortstop Elvis Andrus joining second baseman Rougned Odor on the DL for six-to-eight weeks. Naturally this meant it was time for more pain. 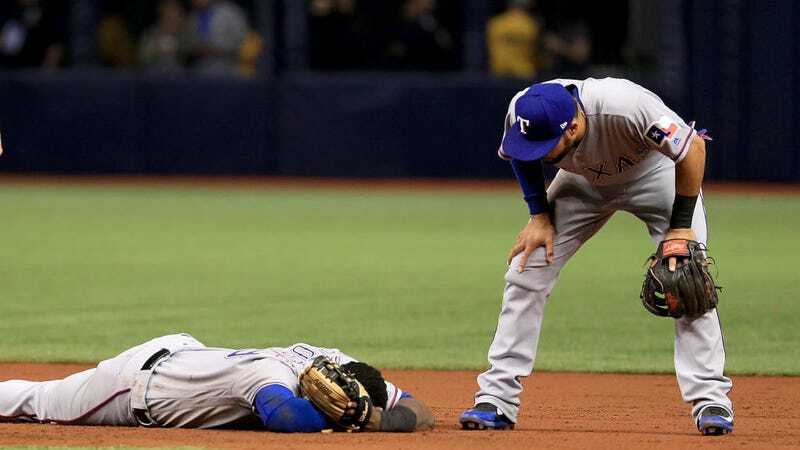 And so, on Monday night, during the second inning of an 8-4 Rangers loss against the Rays and while nowhere near second base, Profar got absolutely gobsmacked by a Mallex Smith slide. Profar left the game and is still in the concussion protocol. He’s not in Tuesday’s lineup, and given the way brain injuries work it’s hard to know just how much time he’ll wind up missing. It would not be a surprise if the injury led to another DL stint for the still-pretty-young middle infielder. Profar missed the entirety of 2014 and 2015 after surgery repairing a torn labrum in his throwing shoulder. You could say he hasn’t exactly sparkled in his years on the field—during his years on the shelf, other prospects passed Profar on the depth chart. He struggled to find consistent playing time, maxing out at 90 games in 2016; his bat hasn’t developed and his vaunted glove never found a consistent home. This year hasn’t been much of an aberration from his career numbers, although he slashed a nice .353/.421/.412 during the five games he’d started before Monday’s injury. It was the first time he seemed likely to claim something resembling an everyday role, and was a rare opportunity to either make his case for more playing time with the Rangers or rebuild his value for a trade elsewhere. It’s definitely possible that I’m a dumbass for thinking Profar has anything left after such a wretched injury history and given the unremarkable work he’s put up at the highest level. But time’s more on Profar’s side than it seems—he’s still nearly a year younger than Aaron Judge, and three years younger than fellow top prospect flop Rick Ankiel was when he finally got it together as a center-fielder. It is let’s say highly unlikely that Profar will ever turn in a season half as good as Judge’s 2017; even Ankiel’s 2008 seems like a lot to ask. But five years after ESPN’s Keith Law declared him the top prospect in the sport, there’s still the sense that no one really knows what Jurickson Profar can do. It’s safe to say that he has shittiest luck in the majors. It would be nice, someday, to see what else he’s got.